There are 17 varieties of crops that can mutate into new versions of themselves for a total of 172 crops: 81 crops and 81 great versions of the same crops. Some crops will trigger a mutation with very little effort on your part, but some others only mutate from already-mutated crops plus utilizing crop-specific fertilizer. If the crop you're trying to mutate requires a special fertilizer, it must be applied at least once while the crop is growing. The mutation-triggering fertilizer doesn't need to be applied every day. For crops that can be harvested multiple times (strawberry, corn, green pepper, hot pepper, squash, blueberry, watermelon, and asparagus), once the crop mutates into a new variety it will continue to produce the mutated crop. Regrowable crops have the chance to mutate each time they produce harvestable goods during the season they can mutate. For example, a Blueberry grown on swampy terrain during Winter (after using Berry Blend before the plant matures) might give Blueberry at first but then change to Cranberry the next time you harvest. Crops that can be reharvested can also survive the season change if their health is high enough at the start of the new season. The Blueberry and Cranberry example from above can continue to produce well into Spring, though the Blueberry won't possibly mutate into Cranberry anymore. Bastian will buy your grown crops for more than what you can earn from selling directly to Sam or placing in your shipping bin. Dome Cabbage Mutation of Huge Cabbage on grassy terrain during Winter using Cabbage Fertilizer Sell ? Note: When trying to grow Huge Cabbage on your farm, you'll receive both Red Cabbage and Huge Cabbage at harvest time since the parameter difference between the mutations is the use of Cabbage Fertilizer. The mutation from Red Cabbage to Green Cabbage is very uncommon. For example, In my game out of 72 planted Red Cabbage only 4 mutated into Green Cabbage at harvest time. Teardrop Mutation of Red Onion on swampy terrain during Winter using Onion Fertilizer Sell ? Note: Strawberry doesn't like to grow during Winter, so you will want to use fertilize to keep the crop alive until it matures. Berry Fertilizer isn't required to trigger the White Berry mutation. Crimson Mutation of Tomato on any terrain during Winter using Tomato Fertilizer Sell ? Killer Tomato Mutation of Crimson on dry terrain during Fall using Tomato Fertilizer Sell ? Note: Both Fodder Corn and Sweet Corn will mutate from Corn during the Summer season without using any special fertilizer, with Fodder Corn appearing more often than Sweet Corn. Note: While you don't need to use Pepper Fertilizer to trigger the Hot Pepper -> Jalapeno mutation, you'll want to use some Fertilizer to help the Hot Pepper survive until harvest. Black Potato and Titan Potato have very similar icons, but Titan Potato is a little bit wider. Giant Pumpkin Mutation of Giant Sqush on dry terrain during Fall using Pumpkin Fertilizer Sell ? 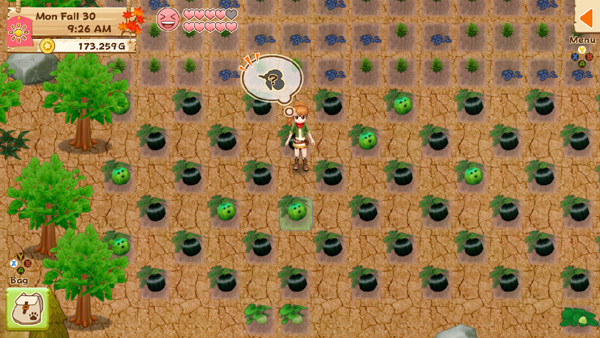 Note: You can also get Cranberry, Gooseberry, and Black Current seeds by completing villager requests. Cranberry Seeds are rewarded for completing Cyril's Country Life 8. Gooseberry and Black Current are for completing Gus' Ore 7 and 8. Since these berry bushes regrow as long as you keep good care of them, you can sell enough fruit to unlock the seeds at Sam's shop without having to mutate the crops yourself. Kegling Mutation of Cannonball on dry terrain during Fall using Melon Fertilizer Sell? Snowman Mutation of Mellow Yellow on swampy terrain during Winter using Melon Fertilizer Sell? Note: When trying to grow Purple Asparagus on mixed terrain in the mountain, you'll receive both Baby Asparagus and Purple Asparagus at harvest time since the parameter difference between the mutations is the use of Asparagus Fertilizer.